The quintessential South Pacific tree is the Coconut Palm Cocos nucifera. Standing up to 30m (100 ft) tall, they are often the first sign of land when one approaches from the sea. Believed to have originated in Polynesia (although some authorities say South America) this valuable plant has many hundreds of uses and could be called the "tree of life" of the South Pacific and the coastal tropics in general. Coconut palms are very salt-tolerant and their nuts can float many thousands of miles and remain viable. The trees live over 100 years and produce 50 to 80 fruits per year. 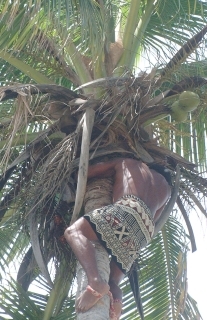 In both Fiji and Tonga the coconut's outer husk is used for matting, fuel and utensils, the trunk for timber and furniture making, and the leaves for thatching. When the nuts are young the clear coconut water makes a refreshing drink. We know that in Southeast Asia this water is fermented or distilled to produce alcoholic beverages, but we didn't see evidence of that in Tonga or Fiji. The sweet white "meat" (what most of us in the West think of as coconut) is eaten as is, or grated and used in cooking. A thick white milk squeezed from the fresh coconut meat is used in curries and fish dishes. Drinks such as piña coladas have made it onto the bar drinks list of many Fijian resorts. There's nothing like the refreshing taste of fresh coconut cream, pineapple juice and rum! At Robinson Crusoe Island, in Fiji, we had a great demonstration of coconut tree climbing. Ziggy, a muscular young Fijian, wrapped a rag around his ankles to keep his feet together, then proceeded to hop up a very vertical, very tall coconut palm from which he harvested the nuts. But there is a technique to it - a tourist saw the demonstration and tried to emulate Ziggy, removing much of the skin from the soles of his feet. 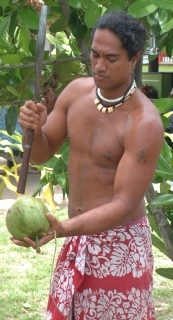 Commercially, the coconut is used to produce copra. Copra is the name for the dried white “meat” which can be seen laid out in the sun in villages in both Tonga and Fiji. Once dried, the copra is shipped in burlap bags to processing plants (of which there are surprisingly few) such as the one in Savusavu, Fiji, where the copra is shredded and pressed for its oil. The coconut oil is sold for use in cosmetics, soaps, cooking oil and margarine. Copra, which is about 65% oil, is a staple commercial crop of much of the South Pacific. It is used in cosmetics, cooking oil and margarine. On top of all that, the trees are beautiful, with their branchless trunks and flowing tufts of leaves dotted with green and yellow nuts. The beaches of Fiji and Tonga are often adorned with the large, almost circular-leaved creeping vine: Beach Morning Glory Ipomoea pes-caprae. Reaching lengths of over 30 feet (10m), the vines descend from above the high tide line to near the water’s edge and bear lovely pink or purple trumpet-shaped flowers. The seeds can germinate and grow in seawater, allowing this plant to flourish on beaches around the world. The Latin name pes-caprae, meaning goat’s foot, describes the shape of the leaves with their circular shape and notched apex. 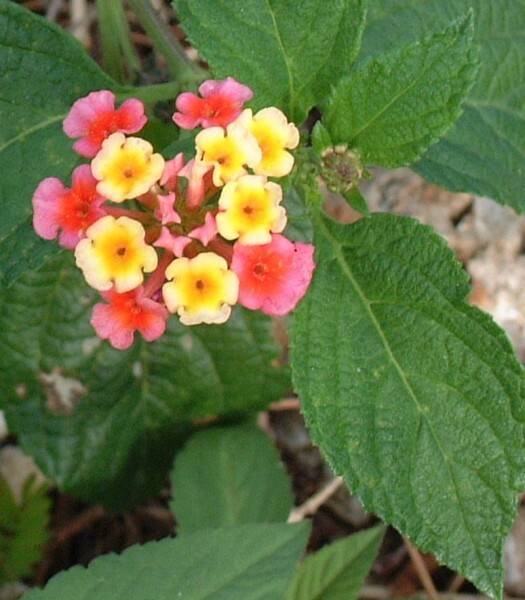 Sprawling, often prickly shrubs of fragrant and colorful lantana Lantana sp. (Verbena family) line the roadsides and yards of Tongan and Fijian homes. Originally from South America and the US southern states, this aromatic plant is now common as an ornamental throughout most of the tropics, and is naturalized in parts of SE Asia where it forms dense thickets. Flower color can vary from plant to plant and throughout the flowering season on the same plant. 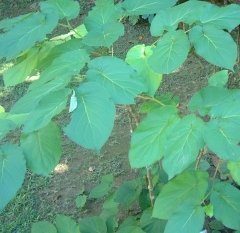 The leaves are aromatic and can be used for medicinal purposes. 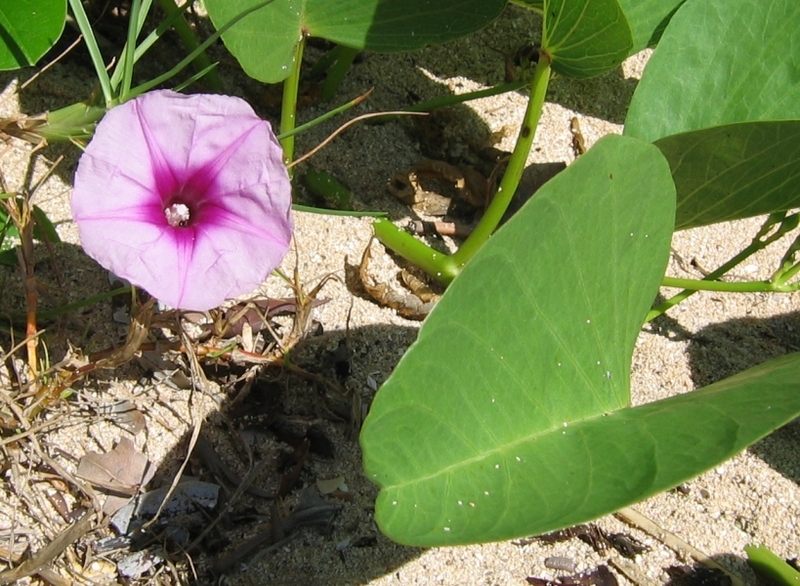 These two plants are commonly found on the seashores of Tonga and Fiji. Scaevola (left) and Beach Heliotrope (right). Both were photographed on a beach in the Ha'apai Group of Tonga. The Flamboyant Delonix regia, is a native of Madagascar, but is now common throughout the tropics as an ornamental tree. With its broad, umbrella-shaped crown, this tree is often planted for shade along streets and in public gardens. The scarlet flowers bloom in spring. The leaves fold up quickly at dusk and are shed in the dry season. The tree, which reaches 10 to 15 meters (30‑45 ft) has many long brown pods, either wrinkled or flat when ripe, can grow to about 60 cm (2 feet) long. 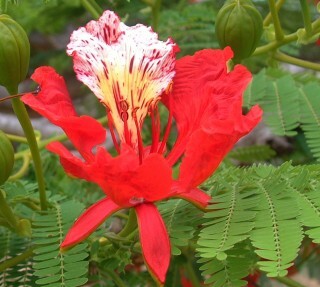 Also known as the Flame Tree or Royal Poinciana, this is the national flower of Puerto Rico. And here we photographed it half-way around the world, in Fiji! Appearing like something from a Dr. Seuss book, the Screw Pine or Screw Palm Pandanus spp. 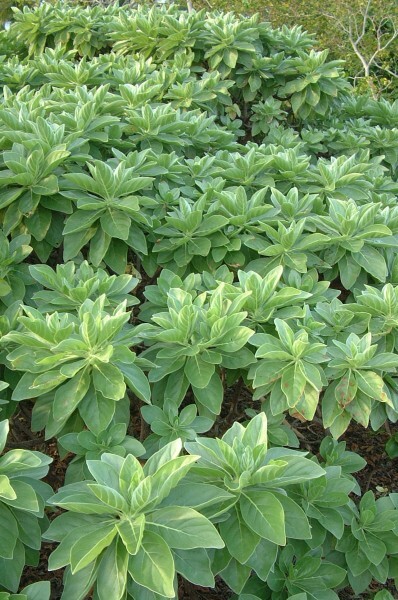 grows like multi-legged creatures on sandy beaches and spray-covered cliffs in Tonga and into the hills of Fiji. 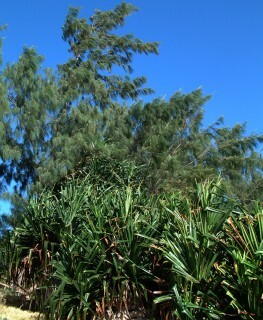 So named for the spiral arrangement of its leaves, Pandanus are also identified by the sharply toothed long leaves, and the several meters’ long roots that extend from the base of the trunk. A large, polyhedron-shaped fruit the size of a human head is found in older plants, and is eaten by some South Pacific islanders. The tough leaves can be made into woven mats, baskets and hut coverings. 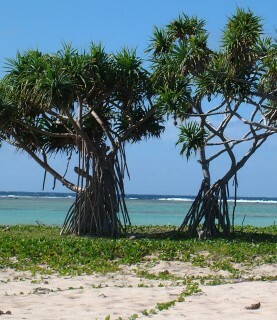 On many islands without forests, the pandanus wood is used to build houses. 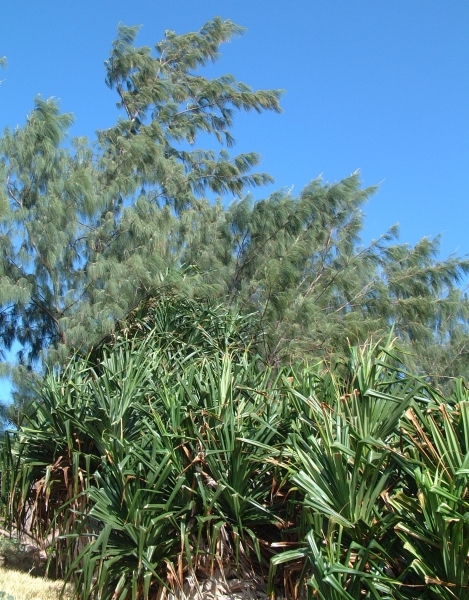 On the coast of Tonga a very common tree is the Casuarina Pine, also called Horse-Casuarina, and South Sea Ironwood Casuarina equisetifolia. 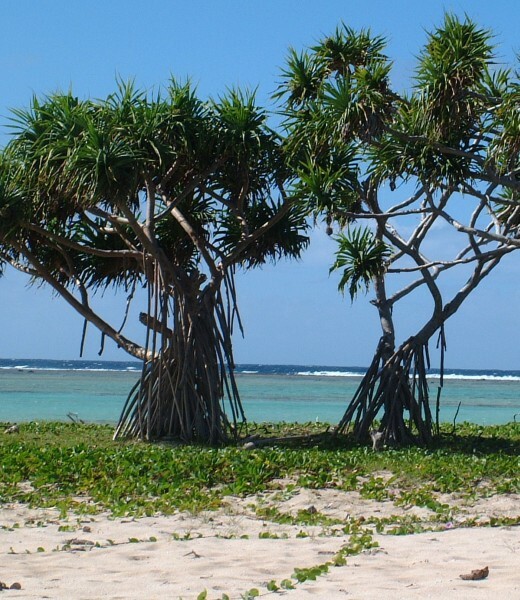 This lovely tree graces most of the coast line of Tonga, its fine filigree of branches with tightly whorled leaves (like pine needles) wafting in the breeze. 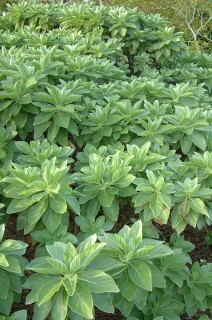 It reaches over 20 m in height and is salt tolerant and quick growing. The trees are not true pines, and have none of the familiar scent of pine trees. It comes originally from Australia, Indonesia and Africa. In New Caledonia and Australia alone there are over 50 species. Passion-fruit Passiflora spp. with 400 species can be found throughout the tropics, some originating in the New World, with a few species from Asia, Australia and the Pacific. 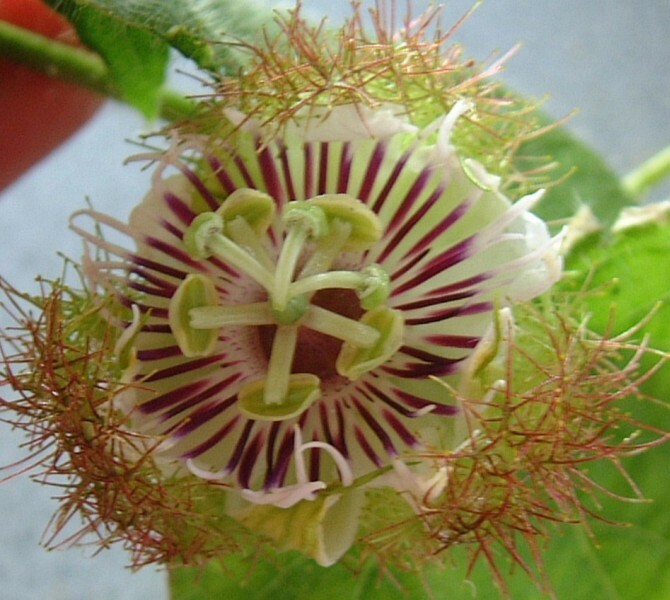 The intricate flower of the passion fruit vine is so named for its visual representation of Christian symbols. We're not botanists, and don’t know what we found, but it was definitely a passion fruit flower, with its striking arrangement of petals, stamen, and ovaries. All passion fruits are vines, and some produce delicious edible fruits. A single plant can produce over 100 fruits in a year, and the vines intertwine to form canopies. Known in the South Africa as granadilla, it is known in South America and the French islands as maracuja. 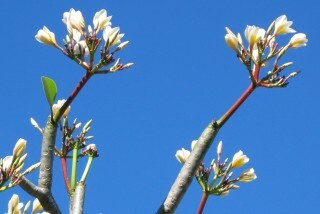 An old friend from the Caribbean is the Frangipani Plumeria spp. which was long ago brought by missionaries to the South Pacific. Not as profuse as in the Caribbean, the trees are nonetheless common and still sport the lovely fragrant blossoms of yellow or pink which are formed in the shape of the blades of a fan. The branches, which are very regular in their branching are thick and smooth and exude lots of latex if broken. 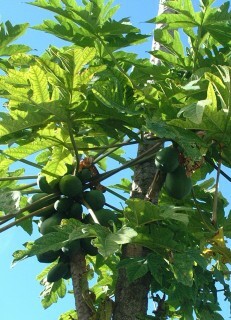 Another migrant from South America is the Papaya Carica papaya, brought to Asia and the south Pacific in the 1800’s. 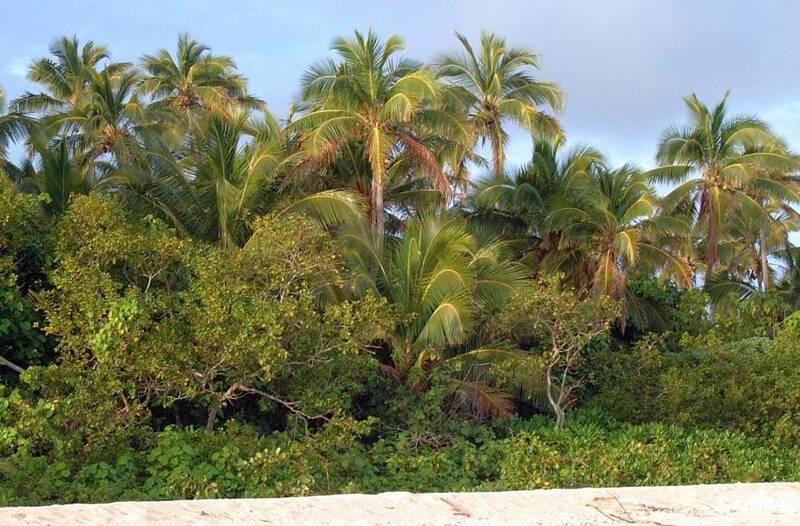 These short-lived trees, standing no more than 18 to 20 feet (5‑6m) high, are found throughout the islands, both on plantations and singly beside homes. Bearing fruits year round they provide a staple fruit and may be either bright yellow or reddish orange inside a yellow-green skin. In Tonga and Fiji papayas in the markets tend to be small (about the size of an oval-shaped grapefruit) and sold in bunches of 4‑6 for about 50 cents US. The large football sized fruits that were common in the Caribbean are not common in the western Pacific. Papayas can be eaten baked and stuffed when green, or with a squeeze of lime when ripe. Common in the markets of both Tonga and Fiji are small, sweet pineapples, a variety of bananas and plantain (cooking bananas), mangos (in season), and pumpkin. Okra, which originated in Asia, is a staple of the Fijian diet and commonplace in the markets. Root crops such as taro, sweet potato, and cassava are also staples, predominantly grown in small family plots, and sold by individuals at the open air markets. In Fiji, the western ends of the two largest islands, Viti Levu and Vanua Levu, are agricultural centers for Sugar Cane Saccharum officinarum. Hundreds of kilometers of narrow-gauge railway bring cut cane to the mills in Lautoka, Ba, and Labasa during the winter months of June through November, and the air is filled with soot from the mills and from the burning fields. The plants originated in Asia, probably in New Guinea and have spread around the tropical world. Sugar cane is a grass-like plant, standing about 15 to 20 feet (4‑6m) high when mature. 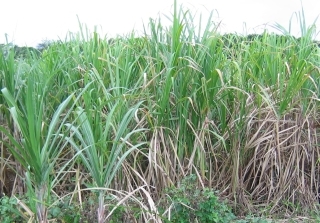 Most cane is grown for less than one year before harvest. 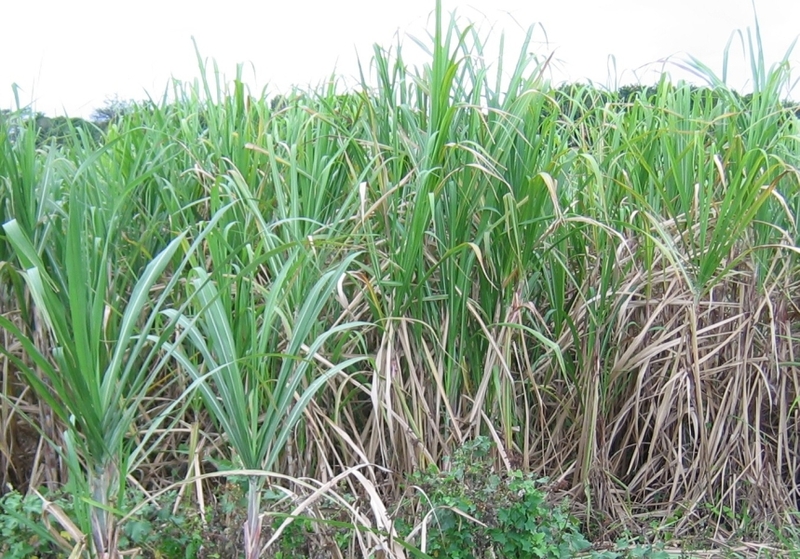 The cut cane is crushed between rollers to extract the sugar juice, and both molasses and raw sugar are exported from Fiji. The Fijians have long known of the curative properties of the Noni Fruit. This large-leaved tree with its knobbly green fruits is commercially grown in the Society Islands of French Polynesia and is found in the wild throughout Fiji. A juice made from the fruit is used to reduce arthritis inflammation, joint pain and general health. The Fijians warm the leaves over a flame then place them on boils to extract the infection. 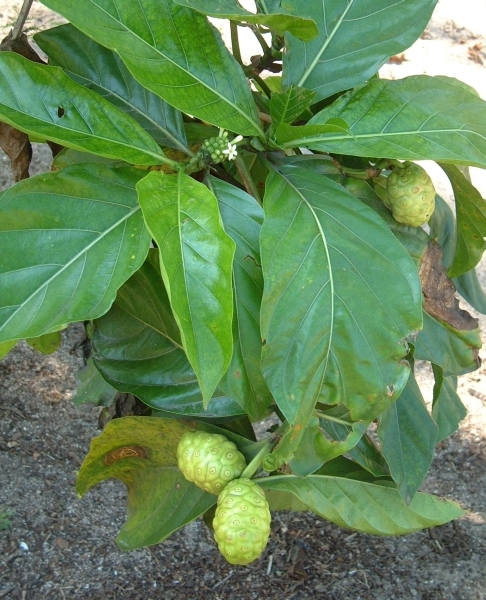 In Fijian, the name of the Noni plant is Kura. 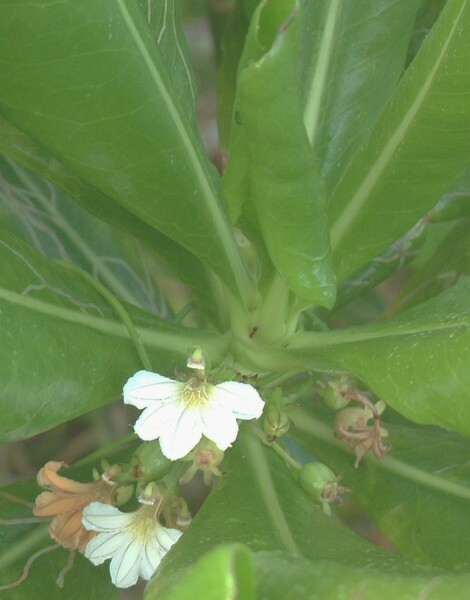 No discussion of the plants of the western Pacific would be complete without mention of the omnipresent Yaqona or kava plant Piper methysticum. 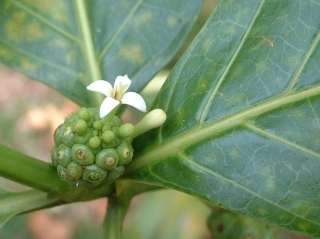 Endemic to Polynesia and Melanesia, the root of this pepper plant is ground into a fine white powder with mortar and pestle, mixed with water, filtered through a cloth and drunk by Tongans and Fijians, often to excess. Originally a drink for the village chiefs, it is now used as a mild narcotic and social drink by male children as young as 12 or 14. Every Fijian and Tongan party serves kava in a large wooden 'tanoa' or plastic bowl and the partying goes on until the kava bowl is empty. It is also served at “grog” houses in Tonga and Fiji. It is traditional to offer a bundle of yagona roots to the chief of a Fijian village when first arriving. If the chief accepts the roots in this sevusevu ceremony he offers protection and hospitality to the visitor. Drinking kava, which tastes like earthy water, produces a mild numbness to the lips and mouth and can be quite soporific. The plants are spindly, ungainly shrubs, reaching a few meters high, and can be seen all along the roadways and homes in the Fijian countryside. It takes four years for the plant to reach harvestable size.